This is one of the most perfect and interesting specimens of a Cromlech that we possess within the two counties, and remains nearly intact. It lies on a farm called Bryn-celli-ddu, in the parish of Llanddaniel, and is marked on the Ordnance [Survey] Map, Yr Ogof. It is about one mile and a half from Gaerwen Station. The chamber inside is of a hexagonal form. The sides are composed of six rude slabs forming the uprights, and are respectively of the following widths:- five feet four inches, four feet, six feet, four feet, and six feet, allowing a space of only twenty inches for the entrance, with a stone twenty-one inches wide, which makes the sixth side. The capstone forming the roof is eleven feet long by six feet six inches wide, and fifteen inches thick. There is a passage leading to the chamber underneath, which is about eighteen feet long (running from east to west), three feet high, and two feet six inches in breadth. It is formed of four slabs on one side and five on the other, the interstices being filled with dry masonry, while the top is covered with rude slabs forming the roof. 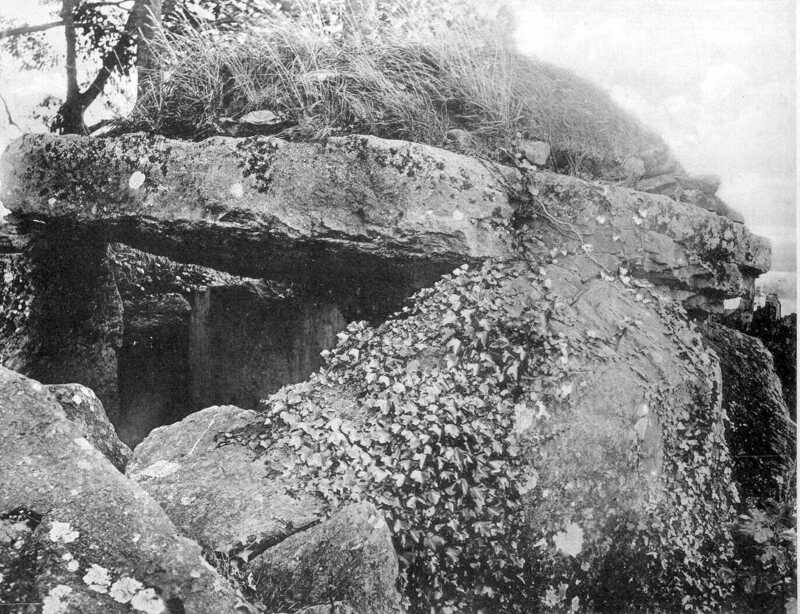 Nearly all the other Cromlechs are so completely devoid of all appearance of the passages leading into them, that the previous existence of such passages seems to have been quite ignored. In this instance, however, at Bryn-celli-ddu we have a nearly perfect specimen of a Cromlech still retaining on the capstone the remains of the original Carnedd (which once covered the whole structure, and also part of the gallery leading into it. (See Arch. Camb. 1847 and 1869).